This is a super simple weeknight recipe, perfect on it’s own or as a side dish. Fava beans are a little bit of work but wow are they worth it! If you don’t feel like messing with them or can’t find them, sub lima beans instead. This salad is not only delicious, it is also gluten-free. I am trying to be more conscientious in creating more gluten-free fare. If you have a smart phone, you should download the Find Me Gluten Free App! This app is great for finding gluten-free dining and I helped create the gluten-free dining cards! I also created a new ‘gluten-free’ tab on the side and am working on placing all of my recipes that fit the category into it. How many of you follow a gluten-free diet? Is this something you would like to see more of? Preheat the grill to medium high. Slice the red onion in quarters and lightly spray with cooking oil. Place the onions onto the hot grill, sliced side down. Add the fava beans as well and cook for 5 minutes until beans are soft and onions are cooked. Remove the onions and beans from the grill. Place the beans in a bowl and cover with plastic wrap, let steam for 5 minutes. Remove from the bowl and shell the beans from the pod and remove the wax coating. Set aside. Finely dice the red onion, and place into a salad bowl along with the shelled fava beans. Bring 2 cups of water to a boil, add the quinoa and reduce heat to low. Cook for 10-12 minutes until all the water is absorbed. Remove from heat and fluff with a fork. Blend together the lemon juice, zest, olive oil, peppercorns, and salt. 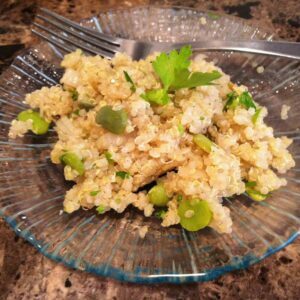 Combine the dressing, quinoa, fava beans, onions, and parsley. Found your site through Recipe Redux and thought I’d stop by to check it out. I subscribed to your feed and can’t wait to see what your next post will be! Thanks for much for your comment! I appreciate the follow!